What you can expect during a typical day at Hockey Opportunity Camp varies based on the age group – but every day is filled with lots of fun! Our four youngest campers (approx. age 7-12) sections rotate through a similar day schedule and our oldest three sections (approx. age 13-16) rotate through another similar day schedule. BREAKFAST: Oatmeal, hot chocolate and cereal are available at all breakfasts. In addition, each day offers a different hot breakfast including pancakes, bacon/eggs, french toast, omelettes, sausages and potato patties. MORNING: Each section rotates through a different morning schedule each day. For example on Monday morning, two sections will go to the rink for hockey/dryland training and the other two sections will participate in their optional camp activities. The next day, the two groups will switch programming. Camp only/water ski campers will stay at camp all day and participate in their activities throughout the day. LUNCH: Homemade soup and dessert are available at all lunches. In addition, each day offers a different lunch menu including, pizza, make your own cold cut meat sandwich, hamburgers, chicken burgers, grilled cheese, macaroni and cheese and tuna and egg salad sandwiches. Some side dishes include fries, tater tots, chips, onion rings, vegetable sticks and dip. AFTERNOON: Each section rotates through a different afternoon schedule each day. This schedule is opposite to what activities happen in the morning. For example, if you go to the rink for hockey/dryland training in the morning, then the afternoon you will participate in your optional camp activities. Camp only/water ski campers will stay at camp all day and participate in their activities throughout the day. 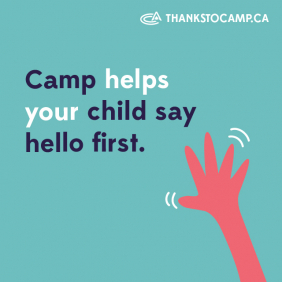 FREE TIME: There is no designated free time, but sections of campers will have an optional time period where they may choose to go for a swim, have a dance party or do a fun activity. TUCK SHOP: Campers will all have an opportunity to visit the tuck shop on Monday, Wednesday, and Friday to get their item of choice. Tuck items may include; chips, chocolate bars, ice cream, candy, pop, etc. DINNER: Salad is available at all dinners. In addition, each day offers a different dinner menu including, pasta (with meat sauce, chicken fettuccine, lasagna, etc. ), chicken breast or fingers, perogies, roast beef, ham and chicken/beef fajitas. Some side dishes include rice, potatoes, vegetables and bread (fresh warm bread baked daily). EVENING: On Monday and Tuesday night, campers have the opportunity to participate in additional camp activities. On Wednesday night HOC staff put on a fun all-camp activity. Thursday or Friday evening campers participate in a camp fire. Evening snack is available to all campers after evening activities. BEDTIME: Each section has a different bedtime. Our youngest section usually arrives at their cabins around 8:30 pm and the older of the four sections go to their cabins around 9:00 pm. WAKE UP: Our older campers sleep in each day – wake up is always 8 am. MORNING: The three oldest sections of camp rotate through the same morning schedule each day. Typical mornings include hockey dryland training (all campers participate in this training) and their optional camp activity. AFTERNOON: The three oldest sections of camp rotate through the same afternoon schedule each day. Typical afternoons include another optional camp activity and optional time period programming. FREE TIME: Afternoons are usually designated for some down time. Campers usually choose to play beach volleyball, basketball or fun group activities at this time. EVENING: The three oldest camper sections go to the rink for hockey training in the late afternoon/evening. Camp only/water ski campers will stay at camp in the evening and participate in additional activities. New this summer, an evening “meal pack” is available to our oldest two sections (Ranger/Senior) campers after evening hockey. BEDTIME: Our oldest sections usually go to sleep around 10:30 – 11 pm. After all, you get to sleep longer in the morning!